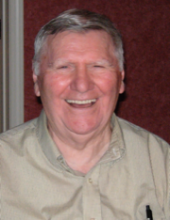 Harold Eugene Wild, 92, formerly of New Vernon, NJ, and in later years, Toms River, NJ died on Wednesday, April 10, 2019. Born in Irvington, NJ on December 12, 1926, Harold is survived by his four children: Doug of Wall; Bruce of Harding; Penni of Stockton; and Barbara Caltagirone of San Jose, CA along with seven grand-children: Chris, Katelyn, Sara, Kelsey, Austin, Jessica and Bryan and two great grandchildren. He was pre-deceased by his first wife Eleanor “Pat” Wild in 1974, with whom he co-owned New Vernon Business Service, and later by his second wife, Marjorie, in 2015. Harold served his country proudly in the Army during World War II. To send flowers or a remembrance gift to the family of Harold Eugene Wild, please visit our Tribute Store. "Email Address" would like to share the life celebration of Harold Eugene Wild. Click on the "link" to go to share a favorite memory or leave a condolence message for the family.